Since its establishment, the Kunsthal has played a vanguard role in cultural entrepreneurship and has seized opportunities where others have failed to see them (yet). As a cultural institution without a collection of its own, the Kunsthal is good at collaborating and in developing unusual cross-overs. The same is true in the field of sponsoring and fund-raising. 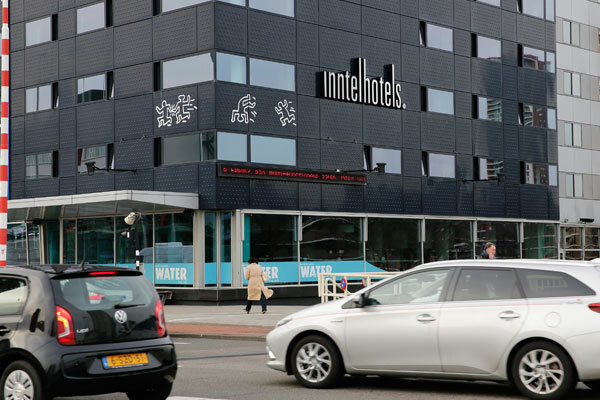 Less than half of the total budget for 2015 was covered by the subsidy from the Rotterdam local authority. The other half was generated by the Kunsthal itself thanks to a broad range of funds, sponsors, members of the Kunsthal Business Circle, Kunsthal Ambassadors and private donors. This means that in 2015 too the Kunsthal managed to double every euro of subsidy, an exceptionally good achievement in the light of the present economic situation. Even though the year 2015 concluded ‘in the red’, the Kunsthal managed to withstand the economic malaise. In fact this was better than expected, because all of the threats have come true: rising expenses, the slow emergence of a culture of giving in the Netherlands, the accumulation of smaller contributions from funds, and an overfished pool of sponsors. Nevertheless, the constant concern about the sufficiency of the funding system and the lack of extra resources to enable further growth is permanently with us. On the one hand, the small organisation is effective and able to catch the Zeitgeist just that little bit before the others do. On the other hand, in the years ahead the limited capacity could lead to a downward spiral. In 2015 the Kunsthal generated almost half of its revenue by itself. Almost one quarter of the budget came from ticket sales, and the other came from external sponsoring and fund-raising. 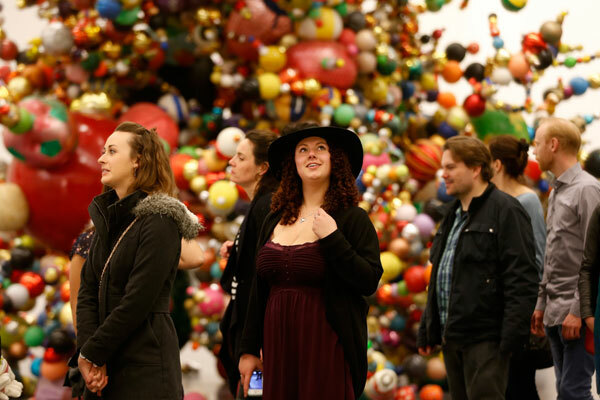 The alert entrepreneurship of the Kunsthal has ensured that savings were made in the running expenses and that the revenue from room hire, catering and the Kunsthal shop increased. Fund-raising is difficult at the present time because the Kunsthal is not the only one to fish in the same pool. In 2015 the Kunsthal managed to convert a long-term relationship into a main sponsorship by ING, which committed itself for a period of three years (2015-2017). Now that the Kunsthal shop is run by the Kunsthal itself since the renovation, it has become more lucrative. 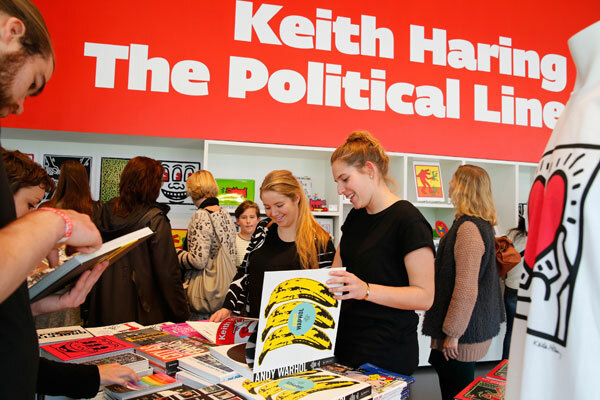 The pop-up store in the well-attended autumn exhibition of Keith Haring contributed to this increase in revenue. The new contract with the management of the Kunsthal café has also led to a higher revenue than before the renovation. The formula of the hire of the Auditorium and Kunsthal café including a visit to the exhibition, whether on a guided tour or not, was used numerous times for business events in 2015. There were thirty business receptions during the Haring exhibition alone. Besides the subsidies and sponsoring that were often provided for specific exhibitions, the Kunsthal has a programme to associate private individuals and businesses more closely with it: Kunsthal Business Circle, Friends of the Kunsthal and the Kunsthal Circle, which pay a fixed amount every year for membership or donate a fixed amount each year. See Kunsthal Membership. 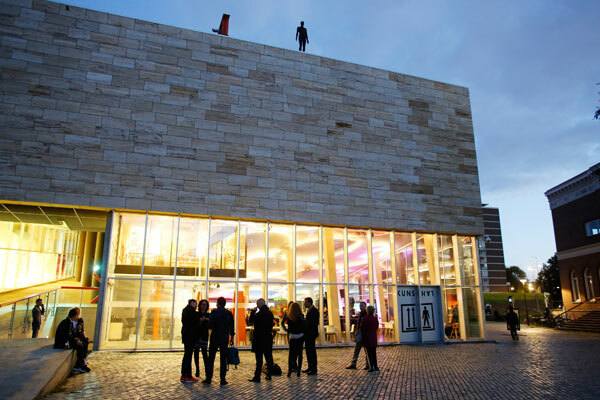 The economic spin-off for the city of Rotterdam from dynamic cultural institutions like the Kunsthal is of great importance. 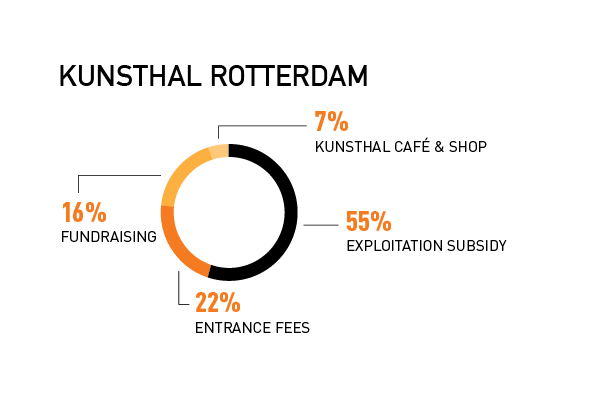 Our own questionnaires held among the public indicate that 63% of the visitors to the Kunsthal in 2015 combined their visit with shopping and refreshments in Rotterdam. Taking the full exhibition programme into account, the impulse to spend in the city could rise to more than € 7 million on an annual basis. In short, in the slipstream of the popular Kunsthal, catering establishments, hotels and shops benefit from the success of the exhibition programme. Moreover, the Kunsthal provides work for dozens of Rotterdam self-employed persons and companies for the exhibition programme, the design and construction of the exhibitions, and in the field of marketing and communication. 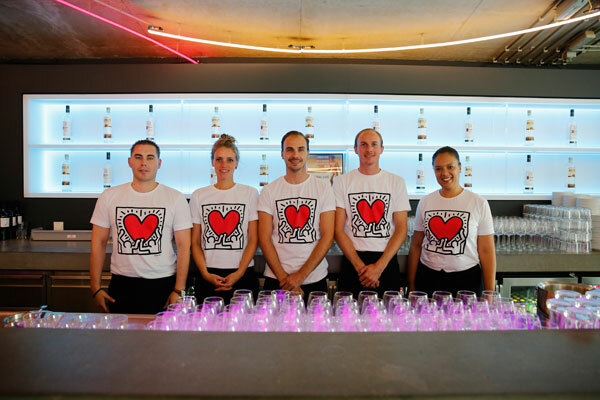 Mutual reinforcement between wholesale retail and the Kunsthal takes place on a regular basis, such as the collaboration in connection with the exhibitions ‘do it (Kunsthal Rotterdam)’, ‘Tomato Factory’ and ‘Keith Haring. The Political Line’.